One of the primary challenges in implementing an electronic lab notebook (ELN) is getting buy-in from the myriad stakeholders who interact with the experimental data being recorded. Nowhere is this challenge more pronounced than in validated environments such as GMP manufacturing. In this area, the need to comply with strict regulatory mandates about how methods, processes and testing are documented and validated has led to even stricter internal controls that are codified in entrenched, paper-based workflows. The reality is that paper is more of a habit than a requirement. AstraZeneca discovered this when they aimed to introduce ELNs to improve the efficiency of their validated workflows for GMP API (active pharmaceutical ingredient) manufacture. Paper and its associated workflows were standard only because they were familiar and had been defined over time to meet the needs of scientists, process engineers and quality control and assurance staffs. To embrace the new electronic paradigms described by Leonard, the AstraZeneca team had to not only convince internal stakeholders of the benefits of electronic over paper, but also select a system and a vendor with the potential to evolve an ELN that would successfully manage data in a validated environment. The team began looking at systems in the early 2000s, when most ELNs were deployed mainly in discovery chemistry. They didn’t expect to find a system that would meet their needs right away. Leonard explained that the ability to develop a system that would help AstraZeneca bridge the divide between R&D and GMP manufacture led the organization to adopt an early version of Symyx Notebook in 2004. “We saw a lot of potential in that system and a real partner in its developer,” Leonard said. Leonard explained that the outcomes of the partnership benefitted both his company and the vendor. In getting the system it wanted, AstraZeneca was able to pass a lot of knowledge back to the vendor development team. AstraZeneca knew its primary goal in implementing an ELN: allowing seamless transfer of process information through all stages of R&D to commercial manufacture. An ELN would eliminate transcription between different document types: from process chemistry ELN records to templated Word-based process description recipes; from printed process descriptions to paper notebook-based batch records for early manufacture campaigns; and back to templated Word documents for batch and campaign reports. Envisioning the solution at the outset, however, was difficult. “We wanted to include the voice of the customer, per the Lean Sigma approach,” said Leonard. But when the team asked users what they wanted, they usually got one answer: Just make it go faster. Leonard was reminded of Henry Ford’s statement about engineering: “If I’d asked my customers what they wanted, they’d have said a faster horse.” It was up to Leonard’s team to be innovative and offer a new approach that would redefine ways of working while providing clear, recognizable paybacks for scientists, managers and QA personnel. “We knew that we had to demonstrate benefits that they had not conceived of,” said Leonard. The team followed an iterative process that began with defining the problem, gathering requirements and creating a concept to pilot and continued through collecting feedback, making modifications and running additional pilots. “In this way we were able to move away from a mindset of paper-based regulatory documents and really start refining the actual business process we were trying to support,” said Leonard. AstraZeneca reconsidered every aspect of technology transfer in transitioning from paper-based processes to electronic ones. 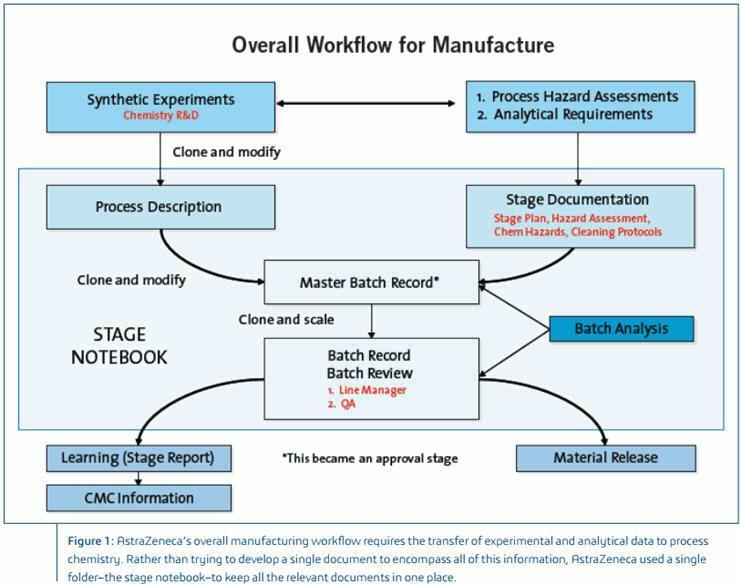 Figure 1 depicts the overall workflow that AstraZeneca follows to transfer processes from synthetic chemistry R&D through manufacturing. When the e-batch records project started, managers proposed that perhaps a single “method of manufacture” document could be used to describe all manufacturing requirements. But Leonard’s team realized that this proposal was based on paper metaphors and, in fact, created a workflow bottleneck. The core of AstraZeneca’s workflow is supported by a simple folder structure that contains all manufacturing documents, including non-ELN (Word, Excel, etc.) files. Each manufacturing campaign has a separate folder containing an individual stage notebook for each stage of the campaign. The process description. This is created in the stage notebook by the process R&D chemist, usually from a clone of an experimental procedure carried out in the laboratory. The process description is improved by developmental manufacturing chemists and contains comments, observations and hold points. An electronic approval workflow allows a line manager to approve the process description. The master batch record. This is initially prepared by cloning the process description. Check-in points, which provide audit trail points during manufacturing, are added at important processing steps and at the conclusion of each significant set of unit operations. The final master batch record is again approved by e-signature to create a permanent pre-manufacture version in the audit trail. Individual batch records. These documents are cloned from the master batch record. Material amounts are scaled to the required batch size and populated automatically by the ELN, which ensures accuracy and provides a considerable time savings compared with manual methods. The procedure section is simply annotated as the batch is manufactured, and actual amounts deviations, and minor process excursions are updated as necessary. Once the batch is completed, final comments and learning points are added to the document, which is finally checked in for review and approved by line and quality assurance managers. The ELN provides the validated, fully compliant environment containing robust, timed audit trails for storage of all manufacturing documents. AstraZeneca has also developed procedures to control the use of documents outside the validated environment. At the end of all the document workflows, publication provides a permanent, visible version of the documents in a centralized and easily accessible location. AstraZeneca ran extensive pilots to evaluate and confirm the functionality of the ELN, verify the efficiency of their workflows and procedural controls and identify areas to refine. Compliance and quality audits were also carried out by AstraZeneca’s R&D and operations QA groups. Leonard noted that the independent audit concluded that the system was “overall acceptable with regard to compliance.” The R&D QA group was particularly pleased with the transparency of the documentation, which made the QA assessment easy to conduct and helped process chemistry gain more insight into manufacturing processes. Some of the questions raised by AstraZeneca’s QA group during the trials helped drive more efficient working practices together with better quality procedures that could be harmonized across manufacturing sites. Additional efficiency benefits were derived by removing non-value adding procedures, and quality management was enhanced by clarifying the purpose and requirements for such things as in-process tests and controls. “The QA function recognized an opportunity to establish a defined business process for GMP manufacture of clinical trials API as part of a pharmaceutical quality system (PQS), all of which is in line with modern regulatory guidances established by the ICH (International Conference on Harmonisation of Technical Requirements for Registration of Pharmaceuticals for Human Use),” said Leonard. “My advice now would be to initiate an e-batch records project with a PQS, business process approach, which is the best way to get all the key stakeholders on board and recognize the universal benefits of the work,” he concluded. This case study was originally written about Symyx Notebook. Symyx was acquired by Accelrys in 2010, and the ELN was renamed Accelrys Electronic Lab Notebook. Accelrys was acquired by Dassault Systèmes in 2014, and the ELN was renamed BIOVIA Workbook.